Last May, I had the pleasure of photographing Jamie for her high school senior pictures (check her out under the category seniors). During that shoot, both Jamie and her mother, Cathy, were very excited about a first grand baby, due in Jan. of 2008. Well imagine my surprise and excitement when I picked up the phone and heard this happy new grandmother calling to see if I could come and photograph her brand spankin' new little granddaughter. Since I am ALWAYS a sucker for a new baby, of course I could. 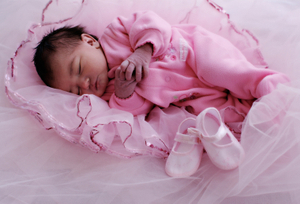 Her name is Kaylin Raye.She was born on Jan. 12th, so she was only 5 days old. This precious baby weighed in at 6 lbs 10 oz and was 20 inches long. Her PROUD parents are Leann and Gilbert. They were just as sweet! All I can say is enjoy her. She is such a beautiful blessing. It will be a joy to watch her grow and discover this new big world, but savor right now, because it goes soo fast. Here is a slide show so you can see for yourself. Click here and turn your speakers on! I guess I'm called the Great Aunt (I'm the mommys Aunt) ... WOW that is the best work I've seen. You have captured the true sweetness of our sweet baby Kaylin! Thank you for that...these are photos we will be able to share for a life time !!!! beautiful work! 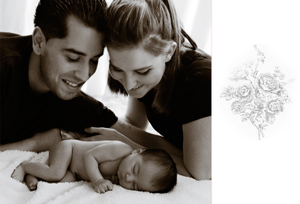 you captured some great parent moments– what documenting is all about. you rocked it... when are we doing coffee? Nope..it's not an album. Just a little something I made for my blog. Thanks for your comment! It is very sweet coming from another photographer who takes some FABULOUS pics!